It is that time of year again – DEF CON is only a mere 7 months away. It is time to start setting up for the SECTF and the SE Speeches in the SEVillage. Do you think you have what it takes to get in the glass booth of doom (some have called it that) and spend 20 minutes showcasing your SE Skills to hundreds of people? Well then get clicking on the amazing artwork below. And if neither of these things are for you, just make sure you join us in the SEVillage for the amazing events we have planned. 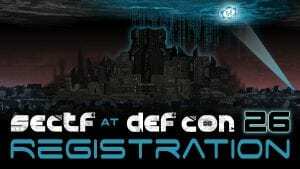 The post SEVillage at DEF CON 26 Launches Sign Ups appeared first on Security Through Education.